Neither the time when the Order of the Garter was founded, nor the cause of its foundation, can any longer be traced with precision; and, in the absence of all authentic records, fable and tradition have been called in to supply their place. The public muniments afford us no light on this remote topic, and the annals of the Order itself are, for nearly two centuries, exceedingly imperfect. The statutes of Edward III. have perished long ago, and the so-called copies of them bear internal marks of having been compiled at a much later period. The Register, usually known as the Black Book, though treating of the Order from its foundation, was not drawn up in its present form till near the end of Henry the Eighth's reign, when its history begins, for the first time, to assume precision and regularity. 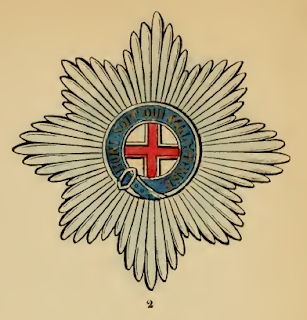 Selden fixes, as the foundation of the Garter, St. George's Day, in the 18th year of King Edward III. and this statement is corroborated by Froissart. The account given by the old Chronicler is, as is usual with him, so naive and so vivid that, like a painting, it brings the whole scene at once before our eyes : -"At this time there came into the mind and will of King Edward of England that he would cause to be made and re-erected the Great Castle of Windsor, which King Arthur had formerly made and founded, where first was begun and established the noble "Round Table" of which were so many good and valiant men and Knights, who went forth and toiled in arms and in prowess throughout the world. And that the same King would make an Order of Knights of himself and his children, and of the bravest of his land, and that they should be called the Knights of the Blue Garter, and that the Feast should be kept from year to year, and should be solemnized at Windsor, the day of St. George. Froissart proceeds to narrate how the King assembled from all his countries. Earls, Barons and Knights, and how he carried out his royal intentions, but our space prohibits our extracting the graphic details. But even with all these data, there is still a mystery hanging over the subject, which it is in vain to think of solving in the present day ; and there is hardly less doubt with respect to the principal ensign, from which the Order has received its name. The popular tradition, derived from Polydore Vergil, is that having a festival at Court a lady chanced to drop her garter, when it was picked up by the King. Observing that the incident made the bye-standers smile significantly, Edward exclaimed in a tone of rebuke : "Honi soit qui mal y pense"; Dishonoured be he who thinks evil of it; and to prevent any further inuendos, he tied the Garter round his own knee. This anecdote, it is true, has been characterized by some as an improbable fable : why, we know not. It is strictly in accordance with the romantic habits of an age, when devotion to woman was one of the first duties of Knighthood. A garter has always been united with sentiments of gallantry, and, to wear a lady's favour, her glove, her ribbon, or any thing which belonged to her, was in those days a common practice, and this token or Emprize was regarded with feelings of which we can have no idea. 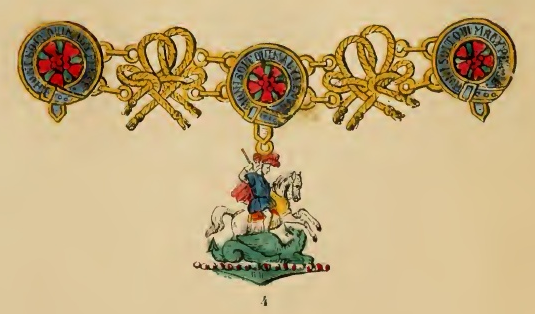 Camden assigns for the period of the foundation of the Order the hattle of Crecy, at which, says that great antiquary, Edward ordered his Garter to be displayed as a signal for the onset. Be the origin of the institution, however, what it may, no Order in Europe is so ancient, none so illustrious, for "it exceeds in majesty, honour, and fame all chivalrous fraternities in the world". The original statutes of this most noble institution have undergone continuous changes : suffice it to add that by a Statute passed on the l7th January, 1805, the Order is to consist of the Sovereign and twenty-five Knights Companions, together with such lineal descendants of George III, as may be elected, always excepting the Prince of Wales, who is a constituent part of the original institution. Special Statutes have since, at different times, been proclaimed for the admission of Sovereigns and extra Knights, the latter of whom have, however, always become part of the twenty-five Companions, on the occurrence of vacancies. The Garter, of dark blue ribbon edged with gold, bearing the motto "Honi soit qui mal y pense" in golden letters with buckle and pendent of gold richly chased, is worn on the left leg below the knee. The Mantle is of blue velvet, lined with white taffeta ; on the left breast the star is embroidered. The Hood is of crimson velvet. The Surcoat is likewise of crimson velvet, lined with white taffeta. The Hat is of black velvet lined with white taffeta; the plume of white ostrich feathers, in the centre of which a tuft of black heron's feathers, all fastened to the hat by a band of diamonds. The Collar, gold, consists of twenty-six pieces, each in the form of a garter, enamelled, azure, and appended thereto. The George, or figure of St. George on horseback, encountering the dragon. 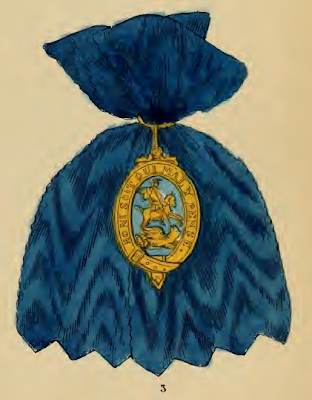 The George is worn to the collar; and the lesser George, pendent to a broad dark blue ribbon over the left shoulder. 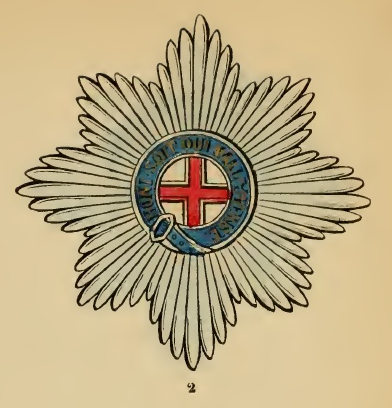 The Star, of eight points silver, has upon the centre the Cross of St. George, gules, encircled with the garter. The Officers of the Order are; - the Prelate, the Bishop of Winchester; the Chancellory the Bishop of Oxford; the Registrar, the Dean of Windsor ; the Garter Principal King of Arms, and the Usher of the Black Rod. Motto - Honi soit qui mal y pense.